It’s the rare Toronto citizen who can survey the changing cityscape from the vantage point of his own bell tower. But developer J.F. (Joe) Brennan has long had an affinity for turning unconventional buildings into monumental living spaces. “I love what’s happening to Toronto,” he says, gazing over the red brick houses of Little Italy towards the rapidly evolving skyline. He believes a shift in preferences – from suburban to urban living – is driving the revitalization of the oldest downtown neighbourhoods. 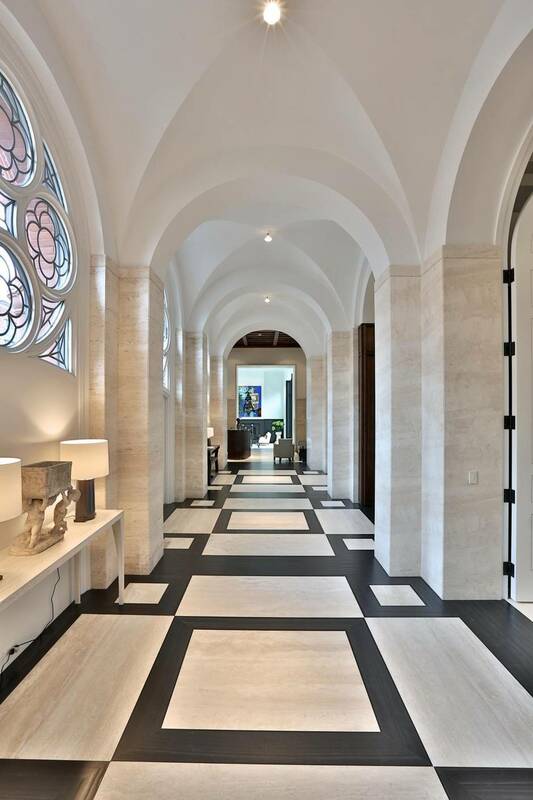 His own home is the most palatial of the four freehold townhouses he created out of the Romanesque Revival building that originally served the worshippers of College Street Baptist Church. Visitors to 510 College St. arrive to a black wrought-iron gate and a low-profile entrance that gives away nothing about the dwelling behind the façade. But step over the threshold and you are in an entrance hall of heart-stopping grandeur. 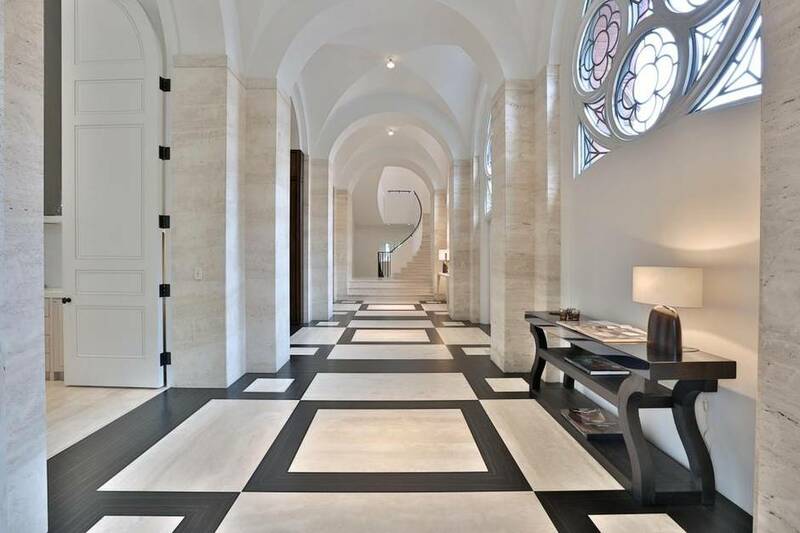 Light streams through soaring arched windows and illuminates the white travertine walls and circular staircase. Mr. Brennan and his partner Daniel Greenglass compare the transformation in the area to the migration from upper Manhattan to Soho and Tribeca in years past. Well-off empty nesters are increasingly willing to trade their stately houses for a luxury condo or a well-designed loft, he adds. 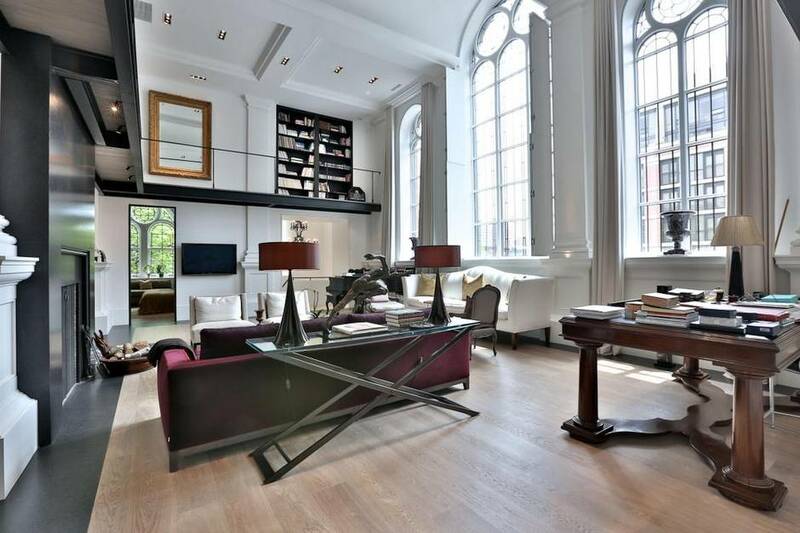 In December another address at the converted church, 310 Palmerston Blvd., quietly changed hands for $9-million. In the past, buyers willing to invest that much in a house in Toronto would limit their search to a short list of neighbourhoods that might include Forest Hill, Rosedale and the Annex. The College Street church building, designed by Toronto architects Langley and Burke, was a late-Victorian landmark that had changed hands several times and fallen into decrepitude by the time Mr. Brennan and his partners began work several years ago. Developer Matthew Kosoy first thought of using the building as a base for as many as 28 condo units when he purchased it in 2007. But Mr. Brennan had a different vision. We’ll keep it to a few singular units, he said, figuring that there was growing demand in Toronto for a Tribeca-style loft conversion. He purchased the largest – with the most impressive architectural elements – for himself. “It really hadn’t been repaired in decades,” says Mr. Greenglass of the derelict building. “But the outside had incredible virtues,” adds Mr. Brennan. Workers spent years just repairing the exterior before they could even start rebuilding inside: fire and vandalism had badly damaged parts of the brick, stone and wood. The fine terracotta details had been chipped and smashed and Mr. Brennan estimates the partners spent $1-million just on restoring the exterior. Each of the freehold townhomes was designed around different aspects of the building’s architecture. That way, they each appear distinct, with a separate walkway from the sidewalk to the front door. The landscaping enhances the sense of privacy and separation. The exterior was granted protection under the Ontario Heritage Act in 2009. Mr. Brennan ran into challenges when he started on the interior as well. He planned to incorporate the east wall of the building, with its tall arched windows, into a grand room. But he couldn’t make it work without altering the exterior wall. His solution was to leave the brick wall intact and set a wall of glass inside it. The brick, painted a soft white, now reflects light from the outside while screening the living room from the street. Despite the obstacles, he prefers tearing apart an old structure to building new, Mr. Brennan says. At the church he put an addition on the west side, importing red sandstone from England and keeping the structure right at street level. 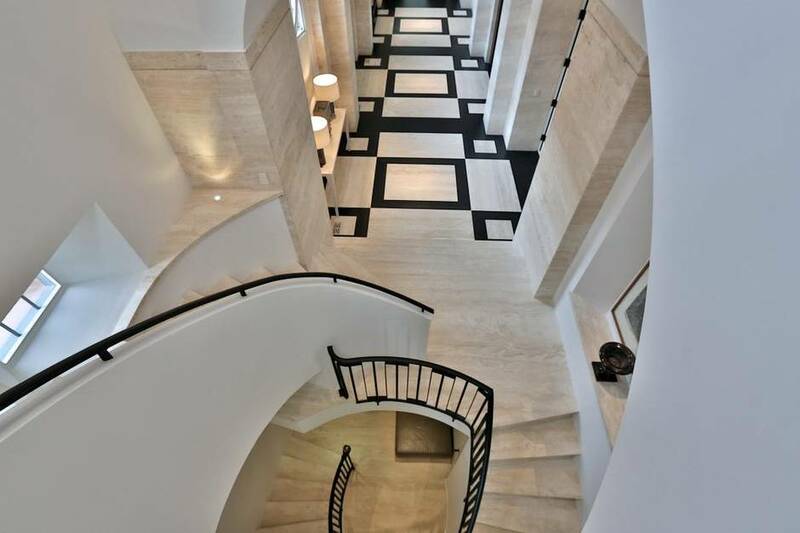 He gutted the interior and built entirely new rooms to create a 10,000-square-foot house. What he retained was the massive scale and hefty pilasters that allowed him to have ceilings 15 feet high. Throughout the home, the coloured glass has been removed from the original church windows and replaced with new, clear glass but, the openings remain. In the new portions, windows are framed in black steel with a very narrow profile. Because the steel frames are so strong, they can support more height, Mr. Brennan explains. The blend of vast spaces in vintage buildings with cool industrial elements and courtyards and rooftop terraces is what drew so many New Yorkers from upper to lower Manhattan. Mr. Brennan believes the denizens of Forest Hill and Rosedale – especially the empty nesters – are making a similar transition. Behind towering wood doors, the kitchen is designed for casual dining, with a wall of glass that brings the outdoors in. 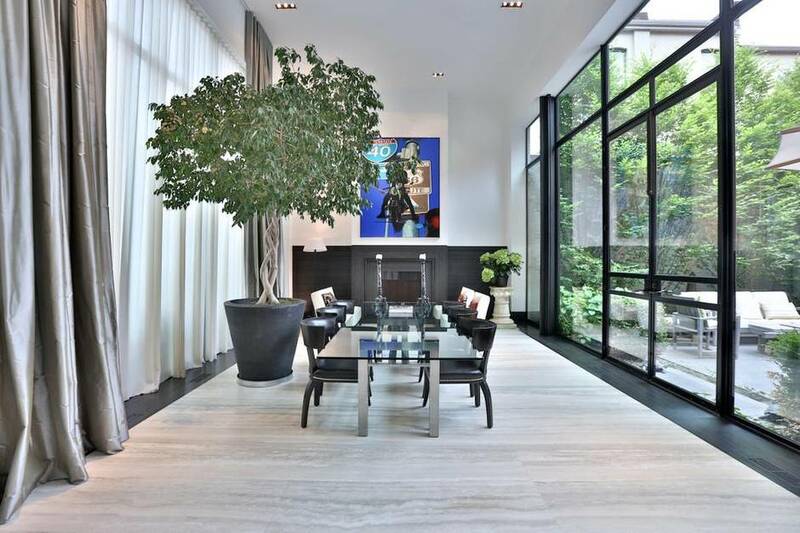 The room that serves as the dining room sits between a window facing College Street and another wall of glass and steel with doors opening to an internal courtyard. 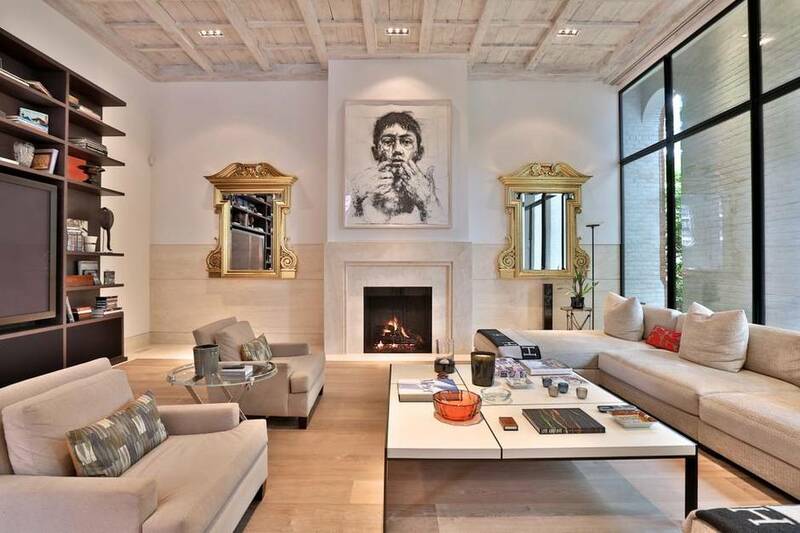 The focal point of the room is a large fireplace. The stone on the floor has been cross-cut so that the striations resemble wood. But Mr. Brennan says he designs spaces that could serve as a backdrop for any number of uses. Mr. Brennan and Mr. Greenglass often rearrange elements in the space depending on whether they want to hold a charity event for 250 guests under the barrel-vaulted ceilings or a quiet dinner party in the dining room. A future owner could use the rooms in an entirely different way, Mr. Brennan says. He could imagine the stone floors and black steel making an elegant backdrop for an upscale boutique, for example. Climbing the winding stairs to the second floor, Mr. Brennan leads the way to a light-filled library and study. To make such a massive room feel more welcoming, he created a gallery running around the upper tier. A substantial fireplace and the smoked, riffed oak floor add warmth. “You accent the double storey and then you cut it up to make it intimate,” he says of the two levels. 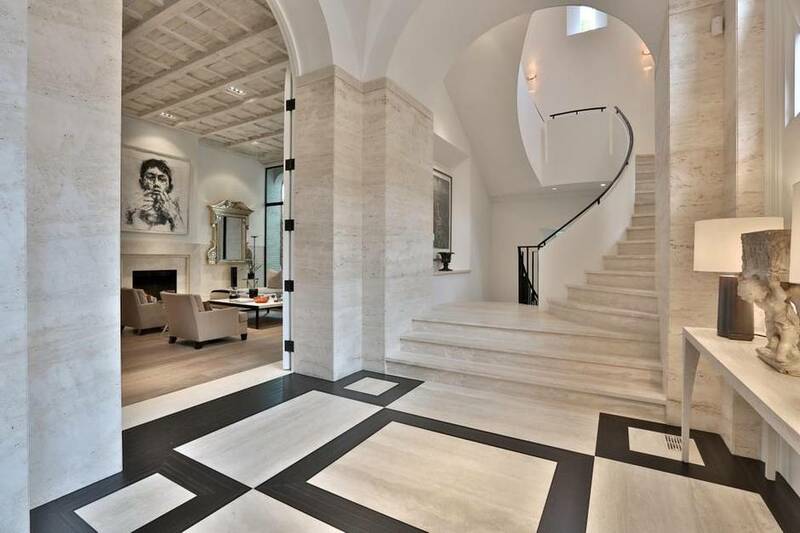 Mr. Brennan also aims to add layers that make a residence anything but ordinary. In the library, one of the bookshelves slides open to reveal a hidden chamber. “It’s sort of a Harry Potter bookcase,” he says. On the lower level, he hid the bench footing behind a 1,500-bottle wine cellar. Most passersby would never know that the converted church has an underground indoor parking garage. Residents can come and go from an entrance protected from the view of the street. Mr. Brennan says the project ran into no opposition from the neighbours. He says it’s just part of the rejuvenation of an area where owners are investing huge sums to renovate the grand Victorian-era houses lining streets such as Euclid, Markham and Palmerston.